I am not a proponent of the ‘pard, nor spruiker of the snake. The closest I’ve ever been to an animal print fabric was a bike seat cover in fake tiger fur. 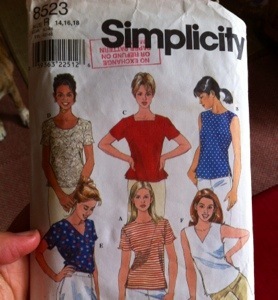 But for our beloved Pretty Grievances, in thanks for many years of sewing LOLs, I will sew me a zoo this month. I thought I’d ease myself gently into this alternative lifestyle with a couple of almost-animal-prints. 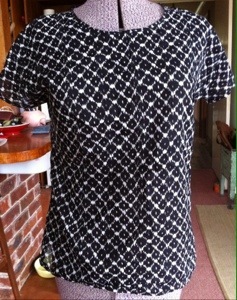 I took this here op shop pattern (Simplicity 8523) and modified it a little – added kimono sleeves, shifted darts, added length, bound the neck – to make a go-to woven tee pattern to use up all those little bits of lightweight stuff I’ve been hoarding. 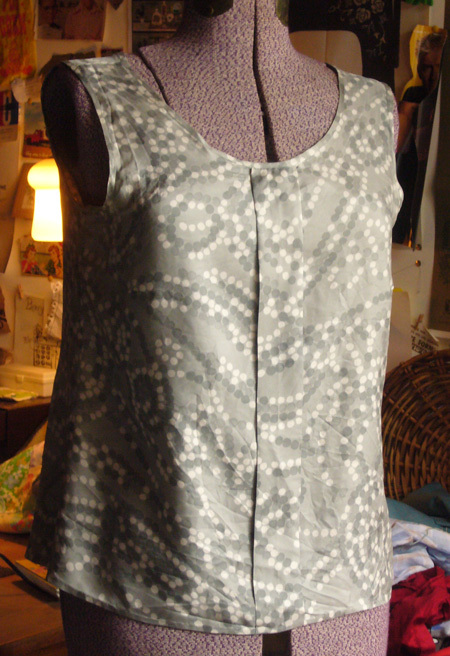 The first is in a voile printed with fake ikat that looks a bit, if you squint, like snake scales. 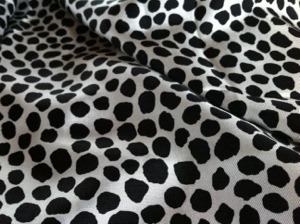 The second is a silk chiffon spot. Both are a bit ace to wear. And next? Boldly, a frock, in true animal print. Well, sort of – not sure what animal these spots came from. 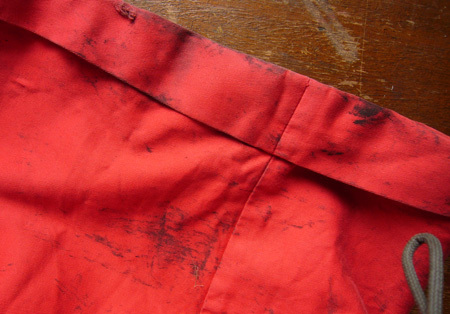 This is a vintage Japanese silk twill remnant from Rathdowne Remnants. To the pattern stash! Contrary to the sluggish activity on the blog, the Ladies’ Lounge Sheltered Workshop has been a hive of activity since the start of the year. Before the reportage gets too unwieldy, it’s time to catch up. 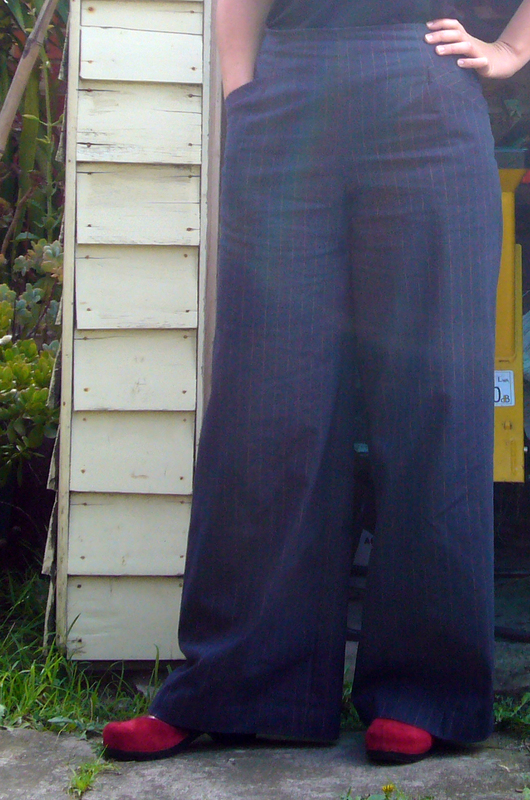 Actually, I made this twice, but I ditched the first version to the op shop after it shrunk in the wash. Second bash used a remnant of vintage silk from the Rathdowne Remnants haul (I don’t know why it’s not in those pictures. Probably because silk is slippery stuff.) 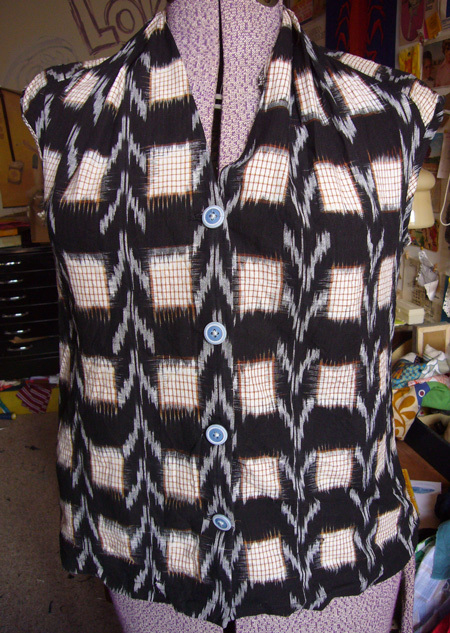 It was a tiny little piece but I loved it so, and I wanted to find a very simple shell that didn’t take much fabric. Enter the Sorbetto. I’m not much for shapelessness and to be honest, it’s a bit borderline. But tucked in and cardiganned, it’s swell. 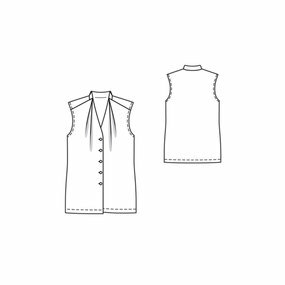 There’s something about a neckline that’s high at the back and pleated that just looks so damn classy. So this one was a no-brainer. I shelled out my $5.40, printed it and glued it all together. That's a lot of white space, Burda. After the expected BS wrangling, this one is pretty nice. So nice that I made it twice. Once for me, and once for my friend for her birthday. Most edifyingly, she wore it for three days after I gave it to her. Less edifying, I didn’t take a picture. 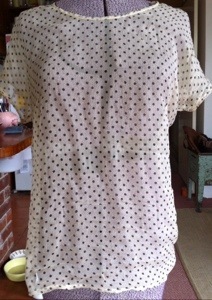 But here’s mine, made from a big ol’ mumu I bought from an op shop years ago. 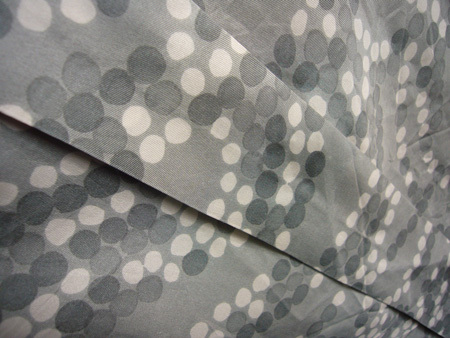 It would work best in something a little softer and drapier, I think, even though BS wants it made in poplin. I picked up this denim with rainbow pinstripe for a song from Clear It years ago. I think it was $5/m plus a 20% off sale. Needless to say, I bought metres and metres of it. It’s made a dress for a friend, a skirt for me, and now these high-waisted, wide-legged beauties. Clown pants, clown shoes. Perfect. I’ve still got the two and half dresses to explain but I’ve rambled so long I reckon I’ll cover them in a different post a bit later.